Browsing for products, all the forums, navigating various facilities, changing settings. I recently tried to rebuild my prefix for Galaxy (and one specific game on it). I followed all the instructions, and everything works, but cloud saves don't sync properly. The installer for each game you install with Galaxy warns about permission issues (and recommends running as administrator). Given that permissions issues are one reason why this game (and Galaxy) won't run in vanilla Wine for me, I suspect this might be why. Recently I downloaded GOG Galaxy from GOG.com.I installed this program but it didn't run. Wine write: "Essential components needed to start GOG Galaxy are missing .Please reinstall the application".Maybe someone knows which components are needed to start?If so, please tell me problem solving. Can you try symlinking folders as it's written further down in the comments? That should solve the problem. Otherwise Galaxy seems to be installing normally even without symlinking using the latest version. 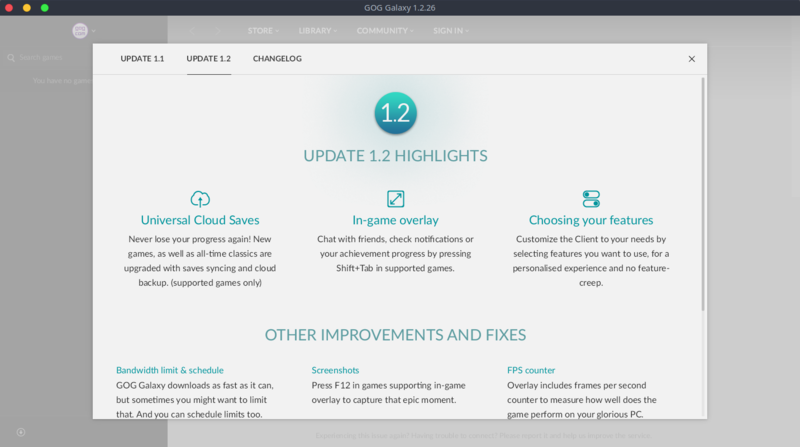 Hello, i am also having the same issue, even after symlinking the folders as indicated, Galaxy is still saying "Essential components needed to start GOG Galaxy are missing .Please reinstall the application", do i need to install something else besides vcrun2015? 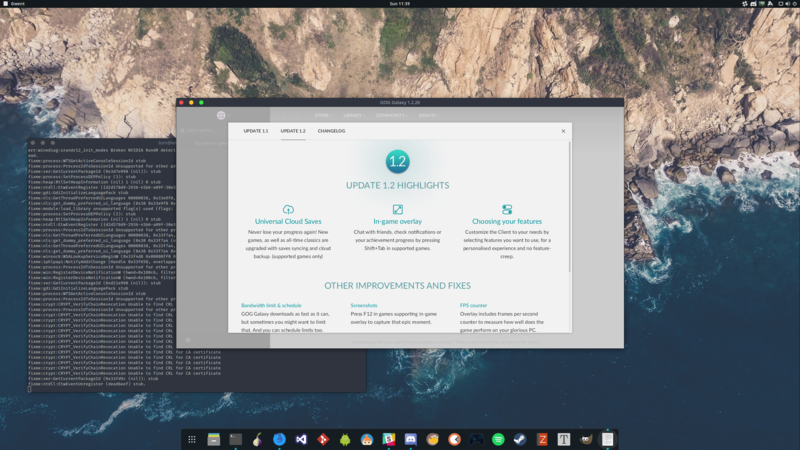 Installed perfectly, runs perfectly, only installed corefonts through winetricks. Didn't attempt any other work arounds. BEFORE installing Galaxy, symlink $WINEPREFIX/drive_c/ProgramData to point to $WINEPREFIX/drive_c/users/Public. Then install Galaxy. If it's installed already, use `wine uninstaller` to remove it, create the symlink, and reinstall. You will also need `winetricks corefonts` or you'll have no text anywhere. The ordering there is throwing me. Do you mean `ln -s $STUFF/ProgramData $STUFF/user/Public` or the other way around? For some reason, more recent versions of Galaxy install the "redist" directory in $HOME/.wine/drive_c/users/Public/GOG.com/Galaxy/redists, but then try to find those executables in $HOME/.wine/drive_c/ProgramData/GOG.com/Galaxy/redists instead. I figured the real location of the executables by rinning the installer with "/LOG=c:\galaxy.log". This causes the installer to log all file copy operations. * After the install completes, DO NOT run Galaxy right away. If it shows an error about losing connection with the helper and it needs to shutdown, ignore it but don't close the dialog. Just leave it there. BTW, adjust the above paths to fit your situation. Galaxy 1.2.34.10 doesn't install what it needs. So it seems that I have found a possible reason why the newer Galaxy client doesn't work on wine. It looks like it doesn't install all the files it needs to function. The previous client version that worked for me was 1.2.8.0, and it installs service executables into C:/ProgramData/GOG.com/Galaxy/redists. In particular, there are GalaxyCommunication and GalaxyUpdater services. If someone has any ideas about what we can do to the installer to fix that, that would be greatly appreciated! Hi, I followed all the instructions, everything works perfectly, but overlay still doesn't work in Gwent - says that GOG Galaxy is not running. So, there is one idea I have. When wine asked you if you want to install Mono and Gecko, did you agreed on any of them? #1: Are you back in windows 7 version and not still in XP? After you switch this repair the virtual drive, And sometimes just repairing the virtual drive can solve issues on it's own. Always worth a first try. (( fixme:msg:pack_message msg 14 (WM_ERASEBKGND) ))not supported yet. Line 82 in your log file. Try to set the Graphics tab in winecfg to a manual sized desktop 1280x1024 make sure you do not have a theme selected under desktop Integration wincfg tab either, Check allow window manager to decorate the windows, check allow window manager to control the windows. and check the emulate to chose a virtual desktop size. After changing settings around lots be sure to repair the virtual drive it can resolve many little issues. Nice, I hope you can help me solving that! Hello. I am running wine-staging-2.20 with win32 WINEARCH. Can someone help me to fix that? For now can you try to go through those steps again? I've had success on 2.20-staging on both 32- and 64-bit with multiple users, but the steps had to be followed to a tee. I created a new 64bit wine architecture. Then I did the winetrick stuff. Now it is XP. then I installed the galaxy client. Then i wanted to start it, getting an error about winXP not working ... setting to windows 7, start again, getting a crash: "Initialization strategy 'DeelevateStrategy' returned exit code 'Privilege de-elevation is needed.'. The client will exit." Can you check if you have the winbind package installed for your distribution. I have had that as an issue with GOG before. It's part of the Samba comparability library for NT file sharing and i do think GOG may use it for the upgrading of software to synchronize with the servers. Another tip is when installing windows games try to keep your installation folders simple. Instead if having it install to program files\Gog just have it install to C:\GOG it'll make life easier in the long run. Could you try wine staging 2.13 it's the one that worked best for me, I had some issues with 2.20, I suspect that the pacman build is somehow out of sorts. 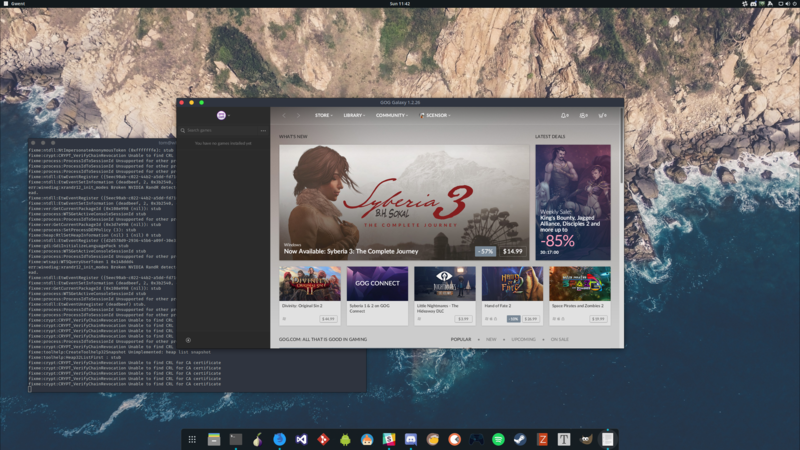 I was on a debian system and used playonlinux with winestaging 2.13 and i get an error on the occasional launch that it crashed, But if you just wait it out it will launch and then just close the error box when you have exited gog galaxy. Hope that may get you in the right direction. But if you are installing over a previous install might be best to start from a clean wine bottle as another option Martin. But only on 64bit prefix. And on 32bit, deelevation error again when chaning to windows 7. I didn't use exact install method or use that version of vcrun, I used the dll overrides msvcp120 msvcr120 vcomp120 atl120, native then builtin selection. 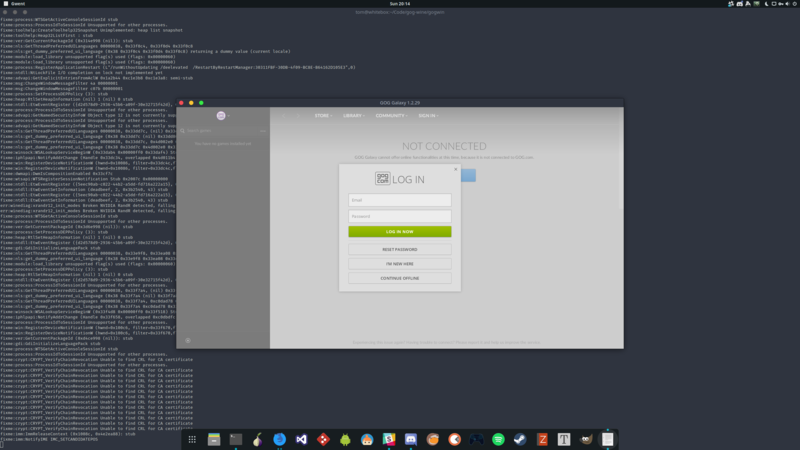 I have issues getting vcrun to install as you did but i was running it under playonlinux to get it sorted fro a user in the forums there. The problem would be windows 7 administrator escalation issues. So i would try to run it in Xp mode for the first install gog client then close out and switch to win7 in winecfg then install vcrun then exit make sure all wine services are killed off then go back and run the client again. making sure no wine processes are left running when switching between windows versions. Oh as a point you should reboot your machine so Samba initializes correctly and winbind is running. Oh as another work around under staging in winecfg there is an option to hide wine version from applications, Might be worth a try to set that option. It's not this hard Martin, You must have some other issues going on here, Bad system files or bad memory possibly to have errors continuing or simply not starting with a fresh bottle. Possibly bad corrupted downloads, really hard to guess at this point. I suggest first running a boot time memory diagnostic and the an fsck on your drives. I tried again today in a fresh bottle and it worked like a charm. I even tested with my main install of gog i use for gaming to switch windows versions back and forth from xp to win7 and back again and i cant get my gog install to error from those changes. But i do repair the virtual drive between switching wine versions. Maybe tcarrio has an idea but this is beyond a wine/ windows binary/ game install issue. I'll leave this up for the day then i think it'll delete this thread. When you have done a thorough system check ^ as i suggest ^ and then tried installing another known working program from a fresh bottle or try something from playonlinux that comes with a pol installer and leave a reply how that works. Well, I don't think that this is caused by my system. I think it is because I have some missing libraries or so. Maybe you could tell me which packages/libs i need to have installed on my system? After rebooting it worked. Sorry, Thanks for all! I suggest that you create new report on it, it's sure is huge step after manually updating, and many people sure will appreciate this. I'll be working on the report when I get back in a few hours! So following the instructions as given above including the optional updated portion (important) I have a 64-bit working (32-bit isn't displaying anything in the launched Galaxy client, just gray) installation. GOG overlay is tested and working in Gwent (only game I have overlay to test in). Gwent install was funky. - Expect a configuration error to occur. 'GOG Menu > Exit' to close out. - Install Gwent again, it should verify local files and successfully install now. I've tested the overlay by playing some games but my buddies haven't been online to chat yet. That will come up next and I'll report my success with the Galaxy overlay. Have you encountered `Privilege de-elevation is needed` error? I haven't encountered that error yet. I did have an issue where Galaxy froze after if clicked through dozens of links saying something about too many files opened. I would suggest not using Galaxy for browsing Gogs catalogue extensively. I encounter it second time, I do everything as you wrote, and after I launch GalaxyClient.exe it throws this error. I don't remember how I fixed it previously, but it was 32 bit client and other machine. You sure you have 64 bit prefix, 2.20-staging and don't do anything else besides what you have written? Thanks. I've gone through the same process twice now to confirm it works. I'll add an update as I do this another time. On my 64-bit machine I cannot get a 32-bit prefix to work with these steps. I have only gotten in WINEARCH=win64. You encounter that issue when running GalaxyClient.exe, so I'll let you know in probably < 10 minutes, that part doesn't take long to get to. Ok, I tried it again, step-by-step, from clean prefix. I get error stating that mfc140u.dll not found. Removing all vcrun2015 related things with wine uninstaller and then using winetricks to install it again brings me to the error I stated in a first message (Privilege de-elevation is needed). Thank you! Yes, changing windows version too early caused it - I guess that in Windows XP mode Galaxy installer fails or don't install it's own libraries and because of it wine libraries work. Working like a charm! You are great, because of people like you community is so awesome. How do you bring the client to front? It looks like I am able to run the client, it stays in the process list, it sends information output into the stream, but I don't have any GUI. There's not even a tray icon that I can use to bring the client up. Any ideas? RE: How do you bring the client to front? GOG Galaxy does not work with Wine Stable and Wine Development branches currently, only Wine Staging and with instructions mentioned in the Notes above.